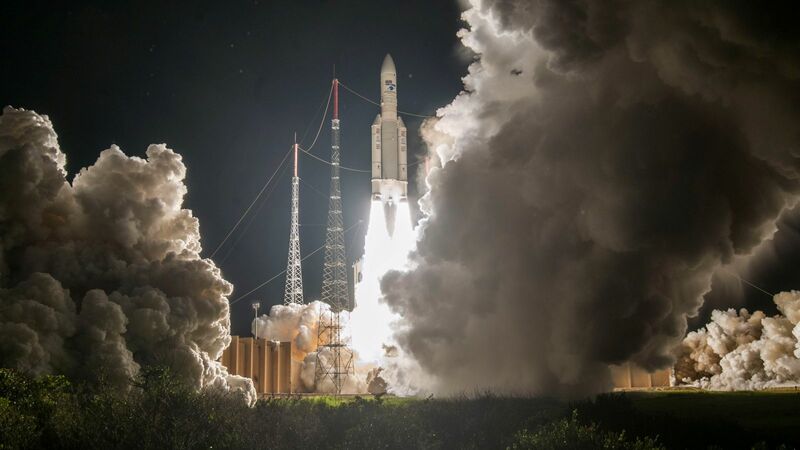 KOUROU, French Guiana — Europe’s flagship heavy-lift Ariane 5 rocket flew to space for the 100th time in history on Tuesday, delivering the Horizons 3e and Azerspace-2/Intelsat 38 telecommunications satellites into orbit. The mission was initially targeting a 6:53 p.m. local time (21:53 GMT / 5:53 p.m. EDT) launch. This historic mission got underway on Sept. 25, 2018, with the flight lifting off from the Ariane Launch Complex No. 3 at Kourou. However, a hold was called within two minutes of reaching T-zero because of a technical issue with a ground-based system. A new time was set for 7:38 p.m. local time, which was at the end of the 45-minute launch window. This time, everything went as expected and the rocket took to the skies. Designated VA243 in Arianespace’s numbering system, the mission was initially scheduled to get underway on May 25, 2018. However, GSAT-11 was sent back to India in late April for additional checks and inspections after communication was lost with another spacecraft in that series—GSAT-6A—shortly after its launch on March 29, 2018. Arianespace rescheduled VA243 to Sept. 7 and replaced GSAT-11 with Horizons 3e. The flight was delayed one more time, by about 2 and a half weeks, making Sept. 25 the new launch date. 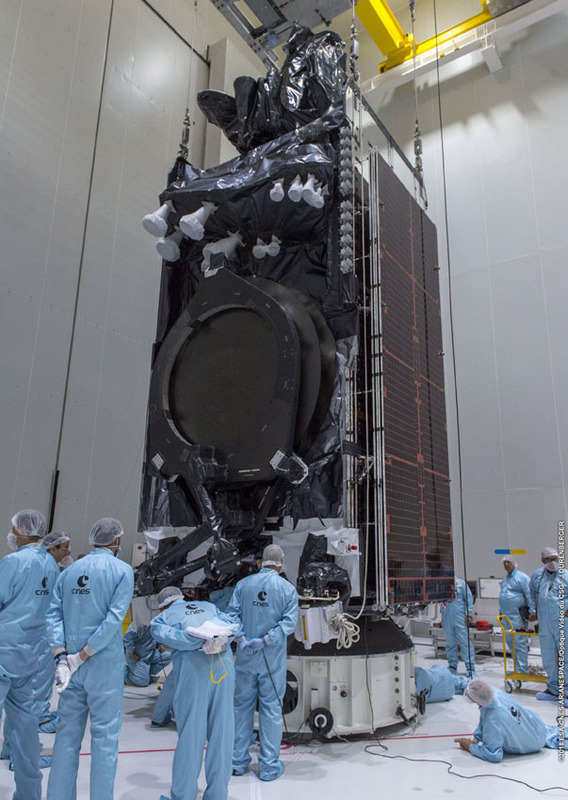 The launch campaign for the mission commenced with the arrival of Azerspace-2/Intelsat 38 and Horizons 3e in French Guiana on Aug. 6 and Aug. 8 (respectively). Throughout August engineers were busy conducting fit checks and other initial checkouts of the satellites. The two spacecraft were fueled in the latter weeks of August. Horizons 3e was integrated with the rocket’s payload fairing first. On Sept. 5, the satellite was installed into the payload adapter and encapsulated in the fairing. On Sept. 16, the team also finished the integration of Azerspace-2/Intelsat 38 with the stack. On Sept. 18, the fairing with the satellites inside was attached to the launch vehicle and various checks were performed. A launch rehearsal was conducted on the following day, with the mission passing its launch readiness review on Sept. 21 – giving a green light for the rocket’s roll out to the pad on Sept. 24. The countdown began 11 hours and 23 minutes before the planned liftoff. About 50 minutes later, checks of the electrical systems commenced. After completing these checks, the rocket’s cryogenic main stage known as the EPC was ready to be filled with liquid oxygen and hydrogen. This began at T-minus 4 hours, 38 minutes. Fueling operations for ESC-A—Ariane 5’s cryogenic upper stage—started some 50 minutes later. EPC’s Vulcain 2 engine was chilled down at T-minus 3 hours, 18 minutes. Some two hours later, engineers performed final checks on connections between the launch vehicle and telemetry, tracking, and command systems. These last checks allowed mission controllers to report “all systems go,” initiating the synchronized sequence during which the tanks were pressurized for flight and the launch vehicle was switched to onboard power mode, leading to the ignition of EPC. The EPC was ignited at T-plus 1 second. Six seconds later, the rocket’s twin solid boosters came to life, lifting the rocket off the ground. The launch vehicle then completed a short vertical ascent before beginning its pitch and roll maneuvers 10 seconds after leaving the pad. The initial phase of the flight lasted for about two minutes, 19 seconds and concluded when the two solid boosters were jettisoned at an altitude of approximately 43 miles (70 kilometers), leaving the Ariane 5 to be powered by the EPC stage alone. The EPC continued powering the mission until about nine minutes after launch, when it was also separated from the launch vehicle. At T-plus 3 minutes, 19 seconds in, the protective payload fairing was detached unveiling the two car-sized passengers. Next, the ESC-A stage fired its HM7B engine and took control of the flight. This started the longest phase of the mission, which was tasked with delivering its dual payload into space. Horizons 3e was deployed first, some 28 minutes into the flight. Azerspace-2 / Intelsat 38 was separated some 14 minutes later. 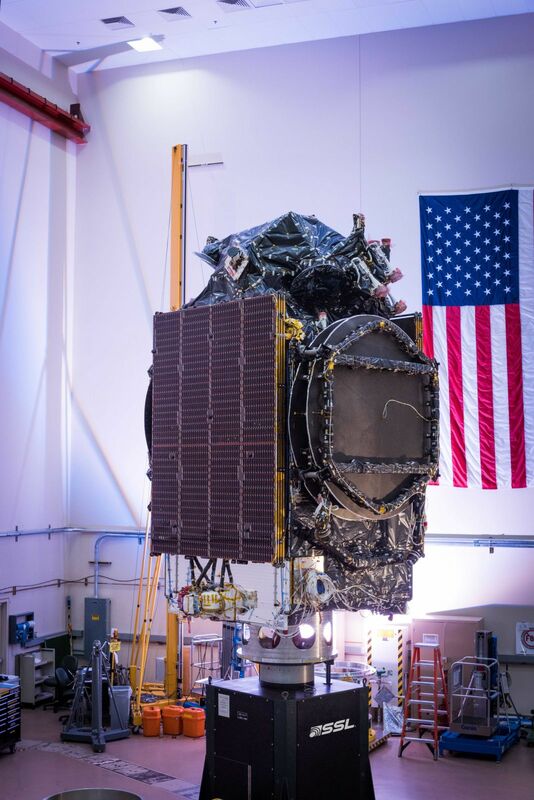 Built by Boeing Satellite Systems, Horizons 3e is a high-throughput telecommunications satellite owned by a joint venture between US-based Intelsat and the Japanese company SKY Perfect JSAT. The spacecraft, based on Boeing’s BSS-702MP platform, has a mass of about 6.44 metric tons, features two deployable solar arrays and is equipped in high-throughput C- and Ku-band transponders. For Azercosmos, the satellite is expected to expand the current capacity of the previous spacecraft in the series—Azerspace-1. It will also increase the coverage area and spectrum of services provided by Azercosmos. The newly-launched spacecraft is Azerbaijan’s second geostationary satellite. The Ariane 5 in its ECA configuration is the heavy-lift rocket Arianespace uses for missions to geostationary transfer orbits and usually carries two telecommunications satellite payloads. The 180-foot (54.8-meter) tall ECA is an improved version of the launcher. It is designed to deliver payloads, primarily communications satellites, that weigh up to 10 metric tons. Tuesday’s mission also marked the fourth flight of an Ariane 5 rocket in 2018 and the sixth launch for Arianespace this year. The company’s next planned flight is scheduled for Oct. 19, when another Ariane 5 is slated to send the BepiColombo spacecraft on a journey to Mercury.